The following are steps our basement waterproofing technicians take when installing a sump pump system in your home. At MidAmerica Basement Systems, our certified basement waterproofers can install a complete sump pump system in just one visit to your home! 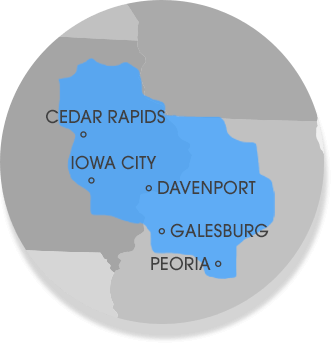 For a FREE sump pump installation estimate in Illinois and Iowa, including Cedar Rapids, Peoria, Waterloo, Davenport and other nearby areas, call or e-mail us today! An airtight sump pump lid, including rubber grommets around all pipes and wires, keeps odors and humidity from rising out of the sump pit, while also preventing items and debris from falling in from the basement floor. Having an airtight, secure lid on your liner is also excellent in preventing animals and children from attempting to play in the water! Outside, an anti-freeze device called IceGuard® is usually installed. The discharge line is buried underground, while the installer is careful to remove sections of the lawn in whole pieces before making the trench for the pipe. This helps to ensure the least disruption to your landscaping throughout the installation. A special outlet is installed flush with the ground and is safe for lawnmower or lawn tractor traffic. To allow for future testing or inspection, MidAmerica Basement Systems will install several "ports" in the perimeter drain, where a hose or dehumidifier drainage line can be inserted. During annual checkups and sump pump maintenance, this helps us with testing and inspection. MidAmerica Basement Systems also provides crawl space sealing and encapsulation! When you decide it's time to waterproof the basement and install a sump pump in your home, we are ready to help! We offer free, no-obligation inspections and written sump pump installation quotes to all homeowners in our Illinois and Iowa service area.